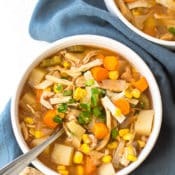 This easy crock pot spicy chicken soup is one of my new faves. It has just the right amount of heat thanks to the salsa in the recipe. 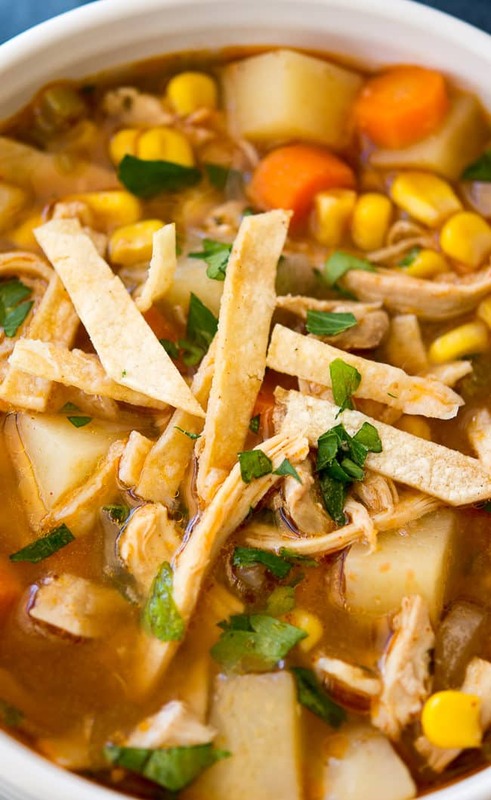 It totally makes sense that I’d love this chicken stew because I am basically obsessed with salsa! 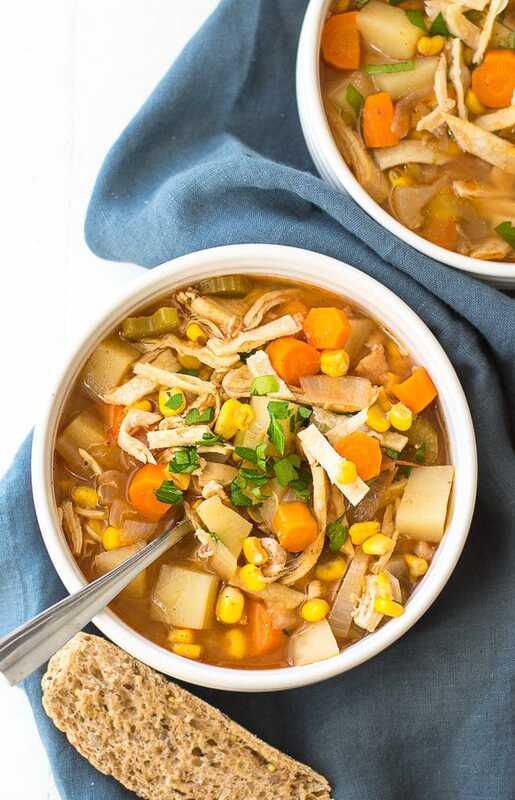 This spicy chicken soup recipe is also great for this time of year because while it’s quite hearty, it’s also light and very good for you. Assuming you don’t pile on a bunch of cheese or sour cream on at the end. Don’t get me wrong, finishing this soup with sour cream or cheese sounds absolutely amazing… in fact, I’m going to try that next time! The good news is, though, that even without the fancy toppings, this soup tastes amazing. 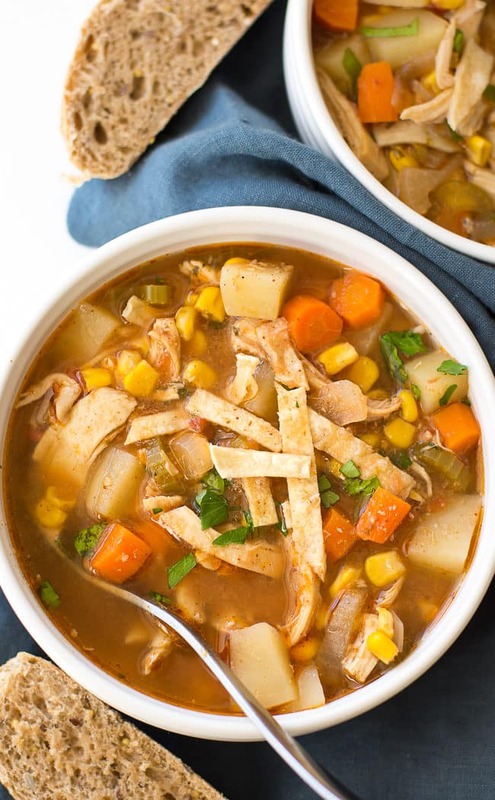 You could even skip the tortilla strips and still have a wonderfully flavorful bowl of soup that’s loaded with nutritious veggies and chicken. Be sure to choose a bottled salsa that you love. I used a mild salsa because I don’t like foods that are overly spicy, but, if you enjoy more heat you could definitely go for a medium or even hot salsa. I love making soups in my slow cooker during the winter. 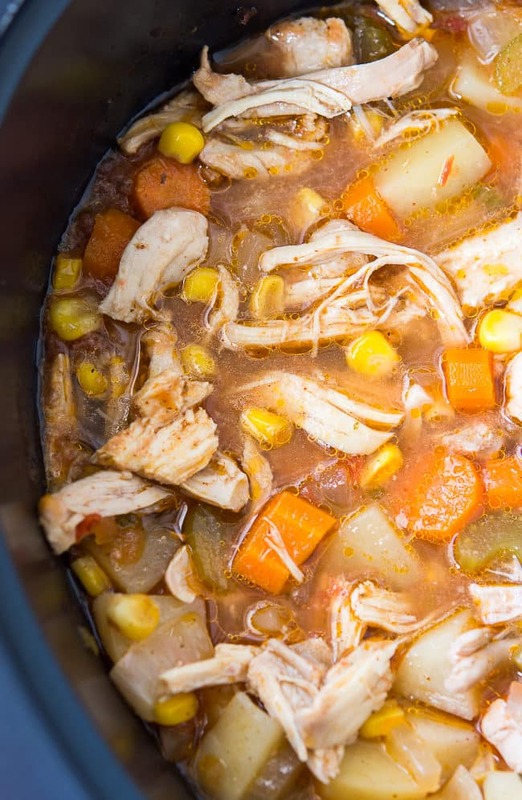 We end up eating them several days in a row, and this yummy crock pot spicy chicken soup was no exception. You could even freeze this soup and enjoy it later on a night when you don’t have time to cook. 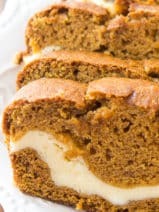 Just warm it up and pair it with some nice crusty bread and you’re good to go. If you’re a fan of crock pot soup recipes, be sure to check out my amazing crock pot white chicken chili. For a healthier slow cooker option, try my clean eating turkey chili recipe. Of course, a classic favorite is also my simple crock pot chicken noodle soup. 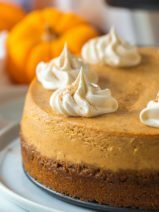 I hope you love this recipe and that you stay warm this winter! 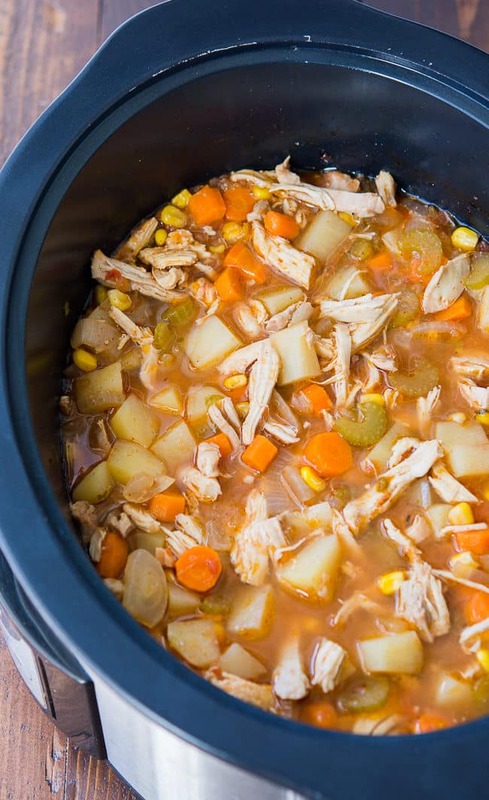 A flavorful chicken and veggie stew that’s perfect to make in your slow cooker! Place potatoes, corn, celery, carrots, onion and garlic in slow cooker. Stir in salsa, cumin, chili powder and pepper. Distribute chicken evenly on top of vegetables and pour chicken broth over chicken. Cover slow cooker and cook on high for 4 hours. 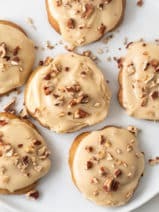 Remove chicken and shred into bite-size pieces; return to slow cooker and cook another 15 to 20 minutes or until vegetables are tender. Top each bowl with tortillas. Garnish with parsley. Made this soup yesterday and it was delicious. I see. Mild salsa, just had a little kick…next time I’ll go up on the salsa. It reminded me of chicken tortilla meets chicken stew.